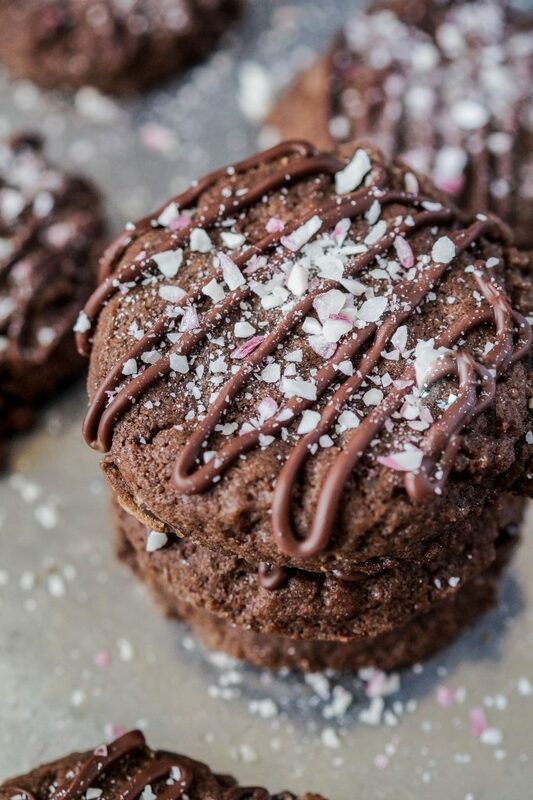 These soft and chewy Chocolate Peppermint Cookies have two types of chocolate, cocoa powder and bittersweet chocolate chips, mixed right into the batter along with a splash of peppermint extract. For an added festive measure, they are drizzled with even more chocolate and topped with crushed candy canes. 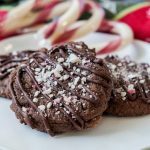 If you have any extra candy canes this holiday season, they are perfect for topping these Chocolate Peppermint Cookies. The cookies are also a great choice if you are short on time and need a last minute addition to your holiday cookie platter/gift box. No refrigeration, rest times, or intricate techniques are required. The addition of cornstarch to the batter helps develop that soft and chewy texture. It pairs so well with the crunch from the candy cane topping. Be sure to only bake the cookies until just set. Right at the 10 minute mark was perfect for me. 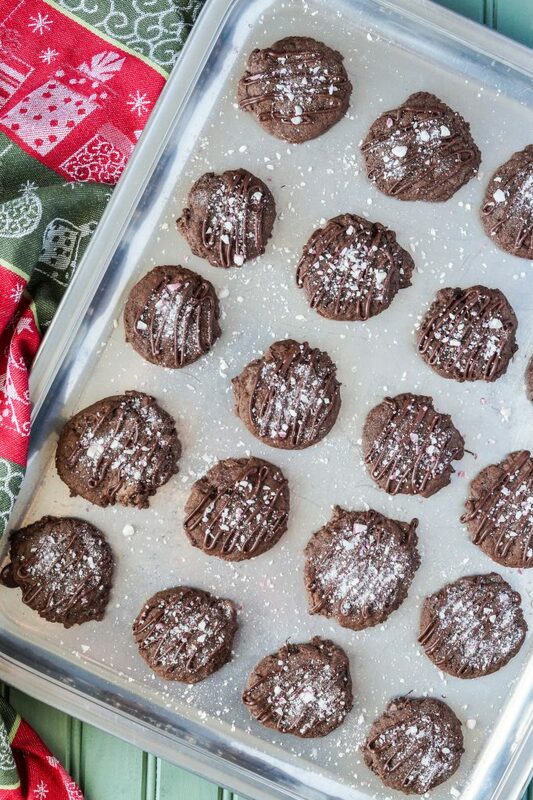 I drizzled the melted chocolate over the cookies, but you could also dip only one side of the cookies in the melted chocolate before sprinkling with the candy canes for a more elegant look. Looking for more peppermint ideas? Try Peppermint S’mores Dip, Peppermint Hot Fudge Sauce, and Peppermint Marshmallows. Preheat oven to 350˚F. Line two baking sheets with parchment or lightly grease. In the bowl of a stand mixer fitted with a paddle attachment or a large bowl, beat together the butter, brown sugar, and granulated sugar until light and creamy. Add the eggs, one at a time, followed by the vanilla and peppermint extracts. In another bowl, combine the flour, cocoa powder, cornstarch, baking soda, and salt. Slowly add to the butter mixture until just incorporated and no streaks remain. Fold in the chocolate chips. Use a small scoop or spoon to transfer mounds of dough, about 2 tablespoons each, onto the prepared baking sheets, roughly 2 inches apart. Flatten each piece of dough slightly with the palm of your hand and bake in preheated oven until just set, about 10 minutes. Allow to cool on baking sheet for 5 minutes before removing to wire rack to cool completely. Using a double boiler or a microwave in 20 second increments, melt the 1/2 cup chocolate chips until smooth. Transfer to a pastry bag fitted with a small round tip or a quart sized ziploc bag with a small corner snipped off. Drizzle over the room temperature cookies. Quickly sprinkle the tops with the crushed candy canes before the chocolate has a chance to set. Once the drizzled chocolate has set, store the cookies in an airtight container for up to 3 days. Love chocolate and peppermint together! These cookies look delicious! Mmm, such a perfect combination. I don’t think I could eat just one! 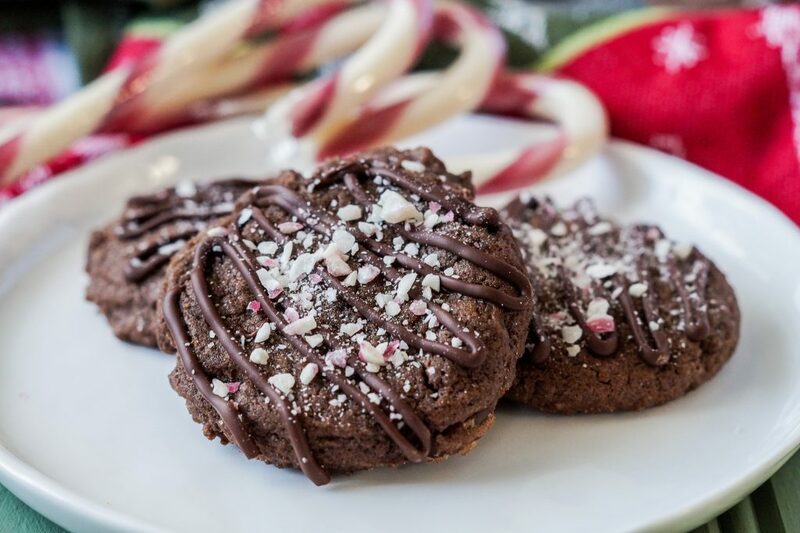 These sound delicious and I love ow you have peppermint extract inside the cookies. My daughter’s all time favorite flavors! Love the crushed peppermint on top! Firecracker would love these cookies!